"Fair winds and following seas" to Capt. Neil A. Karnes, USN, (left) relieved by Capt. 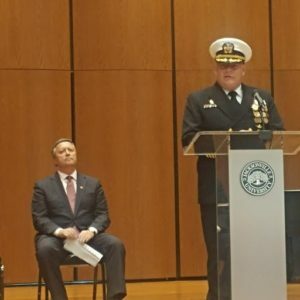 Glen S. Leverette, USN, as Commanding Officer of the Jacksonville University Naval Reserve Officer Training Corps. Capt. Glen Leverette, USN, recently relieved Capt. Neil Karnes, USN, as CO of the University’s NROTC unit in a the time-honored Change of Command ceremony at Terry Concert Hall. The event Jan. 12 included a welcome to family, friends and colleagues of Capt. Karnes and Capt. Leverette by President Tim Cost, an award presentation to Capt. Karnes, an inspirational speech from him as he reflected on his time as CO of the NROTC unit, the reading of official orders for both Capt. Karnes and Capt. Leverette, and a few words from Capt. Leverette. Capt. 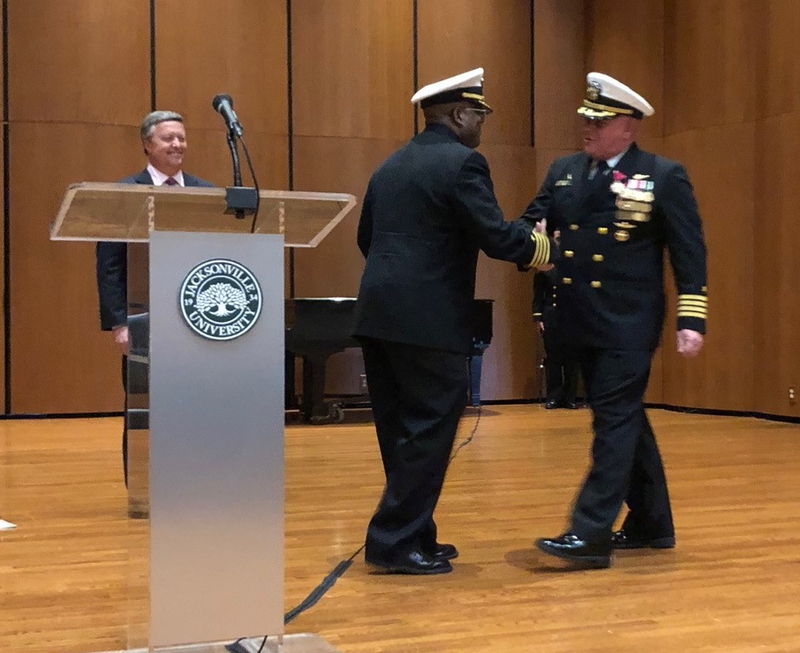 Karnes began his tenure as the CO of the JU NROTC unit in April 2015, and under his command the unit, now in its 47th year, brought into Navy and Marine Corps service 49 new ensigns and second lieutenants. Focused on providing the best and brightest new officers into the Navy and Marine Corps team, Capt. Karnes oversaw the ethical, academic and professional development of more than 120 midshipmen and officer candidates during his time as CO, and under his guidance the JUNROTC unit saw a 24 percent increase in unit honor roll students. Being not only concerned for the training and preparation of his own midshipmen and officer candidates during this command tour, Capt. Karnes also expertly managed the installation and curriculum development for the Conning Officer Virtual Environment (COVE) — a shipboard bridge simulator used to prepare new ensigns for watch standing duties onboard their first ship — for nine additional NROTC units spread throughout the country. JU NROTC was Capt. Karnes’ fourth command tour; he previously held command of two helicopter squadrons (HSL-37 and HSM-40) and was Commander of Amphibious Squadron SIX. For his exceptionally meritorious conduct in the performance of outstanding service during his tenure as JU’s NROTC CO, Cost presented Capt. Karnes with the Legion of Merit award on behalf of the President of the United States and the United States Navy. 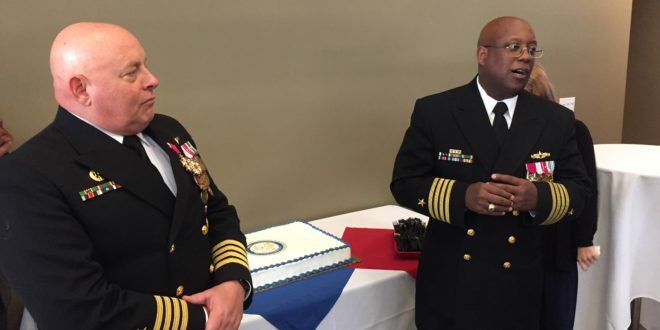 After 31 years of faithful service, the U.S. Navy will say goodbye to Capt. Karnes, as this was his final tour of duty before he retires in March 2018. Capt. Leverette is a Jacksonville native who joined active-duty service in 1990 after graduation from the United States Naval Academy. He said he is excited to begin his tenure as the Professor of Naval Science and CO of the JUNROTC unit. Not only is he eager to oversee the training of the Navy and Marine Corps’ newest officers and prepare the next generation of leaders for the fleet, he said, but as a JU alumnus he also is proud to rejoin his alma mater, where he earned his Master of Arts in Education in 1996. He also received a Master of Arts in National Security Policy Studies from the U.S. Naval War College in 2010. Capt. Leverette joins JU from his most recent tour of duty as Deputy Commander, U.S. Naval Forces Korea, where he was the first Naval Officer to lead in this capacity in the command’s 60-year history. As a new leader at JU with significant experience and expertise, Capt. Leverette said he looks forward to helping with the unit’s continued success.